David, also known as toleda in our community, asked me for help last year (October), but you know me… I am always busy. Or pretending to be too busy, and thus I forgot about his request for help. Then. A few days ago I received another e-mail about it and I thought… Oops I did it again. Sorry David. I complete forgot. Anyway. I have some good news, because we solved the last piece of the SSDT puzzle. Let’s first go back in time. Look at the WiKi of my late sister Samantha. There you will find three really amazing Tiny SSDT examples. Her work in 2011 enabled us to keep the DSDT and/or SSDT tables and still be able to disable/hide and/or rename Devices. Which was a great step forward for running OS X on our hacks. Oh yeah. I almost forgot. She also found a way to decompress/compress the ZLIB files. David, and many people with him, used her TinySSDT examples and came up with great solutions to make things even easier. Audio among others. But one thing was still impossible, and that was that we couldn’t simply rename Device (B0D3) to Device (HDAU) but I have good news because now we can. You can find my TinySSDT example, for a GA-Z87MX-D3H with F6 BIOS right here. The last piece of the audio puzzle is to find a way to load patched copies of the XML files. A puzzle I tried to solve last year, but David was unable to reproduce my success, so I am still using my dummy AudioHDA.kext trick. Which is neat, but it is time for some improvements. Well hello. I checked the latest pre-release package of Yosemite 10.10.3 (build 14D98g) and this is a pleasant surprise. Look here. This kext is for internal Apple PCI-Express SSD Controllers, with NVM Express support. That may be (in part) why the Samsung flash storage in the new Apple MacBook Pro (13-inch) is so much faster. There are also drivers available for all kind of operating systems, except OS X of course. Expect a port some time soon. My plan however is to attack and patch the non NVM Express compliant Apple supplied driver first i.e. 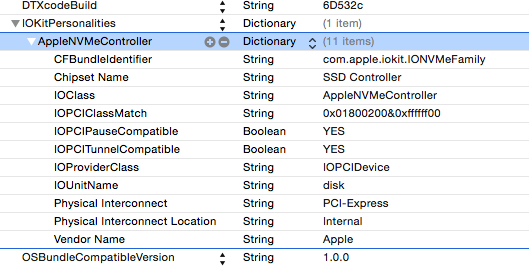 to work around the (broken) PCI class value that Apple is using. Correction iFixit found a Samsung S4LN058A01-8030 controller on the SSD during their teardown of the new MacBook Pro (13-inch). That is the same controller that can be found on the Samsung SM951. The ACPI only version, and thus the SSD is not the one with NVMe support. It would have been nice if Apple had used the Samsung S4LN058X01-8030 (used for the Samsung SM953) but that is not the case. Apparently. This makes me think that the kext is there for a future update. Anyway. Ok. This confirms it. The SSD is not NVMe compatible. Customers may be unable to make purchases from the App Store, iTunes Store, iBooks Store, or Mac App Store. As in all Apple services with (links to) credit card information went off-line. It may be that hackers are exploiting a recently disclosed security issue. This can’t be a coincidence. Smells like rotten apples to me. I love Top Gear and the way that Jeremy Clarkson, Richard Hammond and James May present their show, but seriously… without Jeremy Clarkson there is NO Top Gear. Not for me. Not for many of us who like the show as is, so if the BBC is going to ax him… then the BBC lost me as a fan. And with me many viewer. It’s that simple. Period. p.s. I had the pleasure of meeting the Top Gear crew in Spain when we were looking for a plot for our new house. Fabulous folks! There are sixty-six new Apple Serial Numbers Ending With G000-GZZZ added for the refreshed MacBook Air (11-inch and 13-inch models). A new list with 853 links for Apple Serial Numbers Ending With F000-FZZZ is now also available. The new list includes seven new serials for the refreshed MacBook Pro (13-inch model). Does anyone know what is going on over at Fubra in London Aldershot? I mean first (weeks ago) they lost projectosx.org and yesterday… oops insanelymac.com went down. And with it a lot of other websites hosted by Fubra. I know that joe75 said that they had a harddrive failure and that they were/are trying to recover data from it, but he also said that a backup server was stolen. And now this. Weird stuff isn’t it? So if you know what is going on then please chime in. Thanks! That explains it. Thanks for the update! Sure. I first visited Questionable screenshots claim to show updated 13″ MacBook Air with 1.6GHz Intel Broadwell CPU. A link that I received, and I have to say that I was a bit surprised that they don’t know this already, but let me try to explain how this stuff works. Ok. So when you setup a new 2015 MacBook Air then the text: “(Early 2015)” will be missing. The reason for this is that Apple didn’t update their data files with links to the technical information, and then it shows up blank. The URL that is checked is http://support-sp.apple.com/sp/index?page=cpuspec&cc=G941 and it is using the last four characters of the serial number. And as you click on that link, then you’ll see that it doesn’t show the technical information (which is normally model specific) so it isn’t really working at this moment. Well. Not yet at least, but that is nothing new. We have seen this many times in the past with new products. Especially with products that haven’t even been released.